Luo Diandian didn’t realize it was a big deal to start a “no tubes at your last moment” club until she personally made a life-or-death decision for her family member a few years ago, China Youth Daily reported. Luo’s mother-in-law was hospitalized for diabetes, but suddenly suffered a cardiac arrest after choking on sputum. Doctors put her on respirators, which could not treat her condition but only prolong her life. Finally, Luo and her family made a difficult decision to take her off life support and let her go. After a few months, Luo found a note from her mother-in-law’s diary, which said that she did not wish to be excessively resuscitated if her death was imminent. Luo felt a big relief, realizing that she made the right choice. A former doctor, Luo and her friends built an informal club based on that simple idea. With modern medical technology, a person’s time of death often occurs shortly after the point when life support equipment is shut down. Luo said she believes that patients should have right to decide how to die. But she had no idea that she would eventually make career out of fighting for her beliefs. After her mother-in-law passed away, she found an end-of-life document from the U.S. called “Five Wishes”, which allows people to write down a living will about their personal, emotional and spiritual needs as well as their medical wishes. Currently, more than four million Americans use this legal document. In 2006, Luo decided to set up a formal website called “Choice and Dignity”, which promotes a dignified end to life. The site allows people to write down a living will when they are still consciously able. Since its inception, the site has garnered 870,000 page views. People can tell their family the way they want to leave the world, including specifying whether or not they want life support, Luo said. In addition to elderly patients, China’s medical community has taken notice of Luo’s passionate views. “What Luo Diandian is doing is really important in China,” said Dr. Liu Ruiqi, vice sectary of Chinese Anti-Cancer Association and former Oncology director of the Military General Hospital of Beijing. After more than 40 years as a doctor, Liu has experienced more than 2,000 death cases and heard many sad stories from his patients. He said he doesn’t agree that patients should spend their last minutes on chemotherapy or in the Intensive Care Unit (ICU). Sometimes, he tells his patients in terminal stages of cancer to buy a ticket and travel around the world rather than get useless treatments. These opinions, however, rarely get support from his peers or patients’ families, he said. Most people spend 75 percent of the medical expenses on treatments which occur shortly before their death, the China Youth Daily report said. 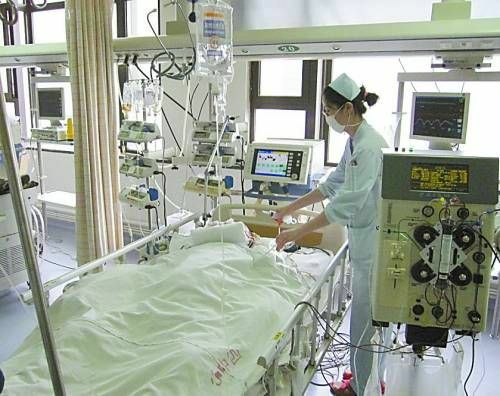 China’s traditional concept of filial duty, instead of doctors’ suggestions, often leads family members to press for continuation of chemotherapy treatments or extensive ICU stays. Xu, one such family member, decided to pursue aggressive treatment for his father’s lung cancer. He spent hundreds of thousands of yuan to pay for his father’s treatment, but has no regret. “If you can barely live, how can you talk about dignity? Dignity is supposed to help you live better, not to die,” Xu said. He said he believes that stopping treatment is “not the grounds of morality.”Xu said he disagrees with Chen Zuobing, a doctor who decided to give his 78 year old-father no treatment for late-stage cancer. Chen, a doctor in the First Affiliated Hospital of Zhejiang University Medical School, said his father’s final days were peaceful and happy. His father went back to his hometown directly from the hospital, said goodbye to every family member, had last Spring Festival with his family, and took a family portrait before he died. When Chen’s story was featured on a TV show, he received much criticism ― even hateful responses ― from viewers. Chen said he still believes the move was the right choice. Also appearing on the show, Luo fully supported Chen’s decision and almost got into a fight with the opposition side. Indeed, Luo has run into her own problems while promoting her “die with dignity” philosophy. In China, people don’t like to talk about death most of the time, not to mention choosing to give up on treatment. Undaunted, Luo said she will continue anyway, and will donate all her organs at the end of her life. She will be happy to see her skeleton hanging in a doctor’s office, she said.